Papa Fotis had the blessing to know, at the Russian Saint Panteleimon Monastery of Mount Athos, the new Saint of our Church, Silouan the Athonite. He said about this acquaintance: "I also had the blessing on Mount Athos to minister to and meet Papa Tychon the Russian. But I also met Saint Silouan the Athonite whose holiness was wonderful. Great personalities." Another time he said: "I went to the monastery of Saint Panteleimon to worship. After worship I headed to the monastery dining room. The dining room some time before had closed to visitors and the monk housekeepers had gone to the Oikonomeio to eat after their services to the visitors. A monk received news of my presence and came to me with love and asked me if I ate. I told him I was not on time for the dining room and it closed. The monk was Silouan and he took me by force almost to the Oikonomeio and he served me. We were given an opportunity to discuss many spiritual topics and the first time I spoke I realized that this is a spiritual man and his face shined with holiness. He explained that he took the obedience of serving in the Oikonomeio for the sake of obedience and thanked God for this obedience." 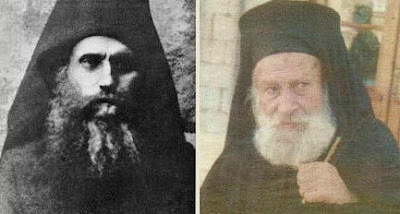 Papa Fotis remembers the advice he received from the Holy Man of God Silouan: "You must love your fellow men, to suffer with them, and pray for others not in a simple way, but to spill blood with your prayer!"